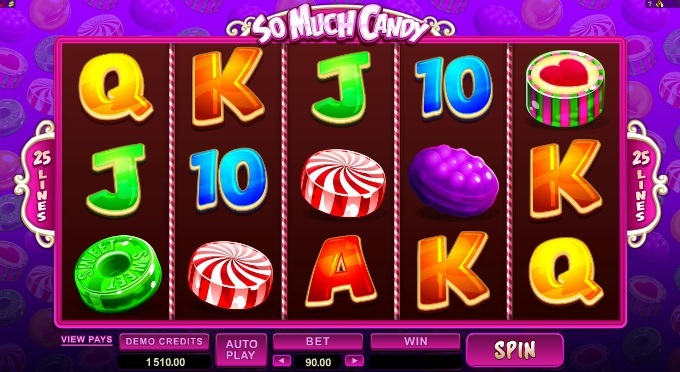 Released in tandem with its less-thrillingly named cohort So Much Sushi and the colorful and brilliantly presented So Many Monsters, So Much Candy is a sweet (pardon the pun) and vibrant slot release from developer Microgaming. If you are looking for examples of how candy-themed slots have translated well to online slots format then you need look no further than Sweet Party from Playtech. So Much Candy is a 5 reel, 25 pay-line slot that looks beautiful and has all the visual glory you would want from a Microgaming slot. The reels are packed with candy and will make sure feel like a kid again as the reels spin with the brightly colored candy symbols. The So Much Candy logo acts as the Wild symbol and substitutes for all other symbols, except for the Scatters, to complete winning combinations. 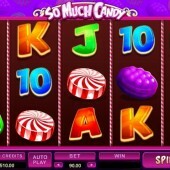 There are five main symbols on this slot that come in the form of five different types of candy. If you hit a winning combination with one of these symbols then those symbols will split and you could end up triggering a winning combination that includes 25 of the same symbols. The Scatters are represented by the gumball machines and if you hit three or more of these symbols across the reels then you will trigger the Pick Your Bonus feature. In the same way that So Much Sushi works, you will be given the chance to pick one of give candy symbols that are linked to a number of free spins up to 16 free spins. However, the lower the number of free spins you opt for the higher the multiplier value so the more free spins doesn't necessarily mean the bigger the pay out. So Much Candy is basically a candy version of its sister slots So Many Monsters and So Much Sushi. The two slots play in almost exactly the same way and the inclusion of the innovative split symbols feature along with the free spins bonus round where you can choose your own number of free spins and multiplier values really is a positive of this slot. If you played So Many Monsters or So Much Sushi and loved it then you will love this. The only thing that is different is the symbols. It's got more colour and resonance but at the end of the day it's basically the same book with a different cover.